…..and tour guides extraordinaires, Cat and Alain. 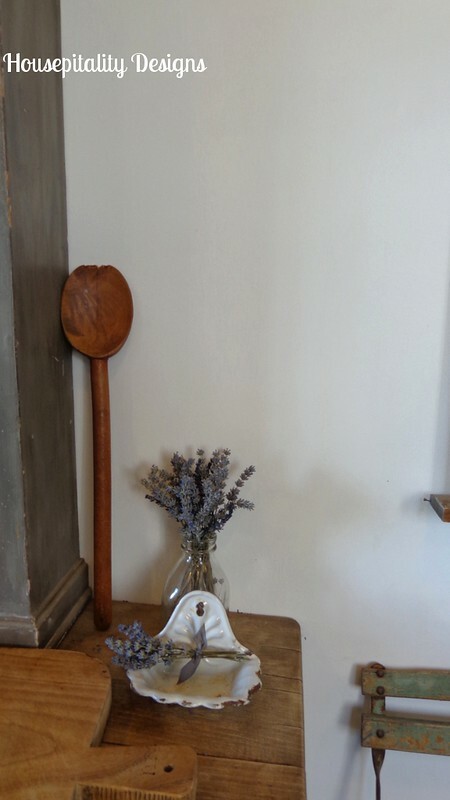 See Cat’s beautiful blog Sunday Brocantes. The day was picture perfect….not a cloud in the beautiful blue sky. Notice the wonderful beams in the ceiling….these spectacular beams are throughout the house. As you enter the kitchen you immediately see this wonderful farm table that Cat uses for her food prep. 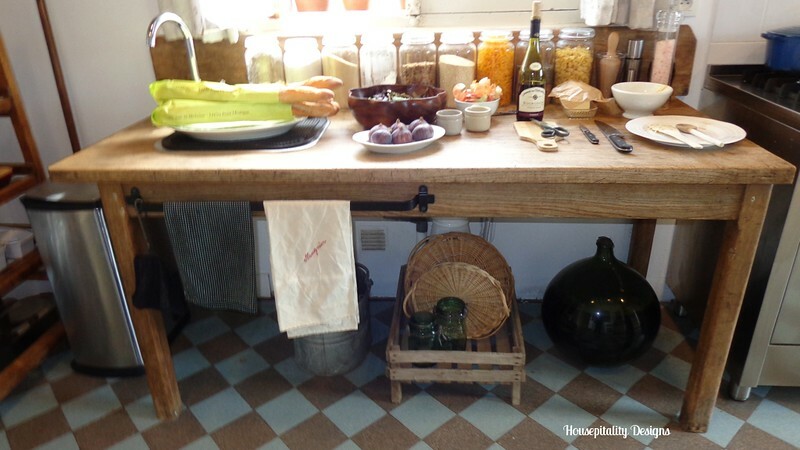 Her hubby Alain retro fitted the table with a sink. 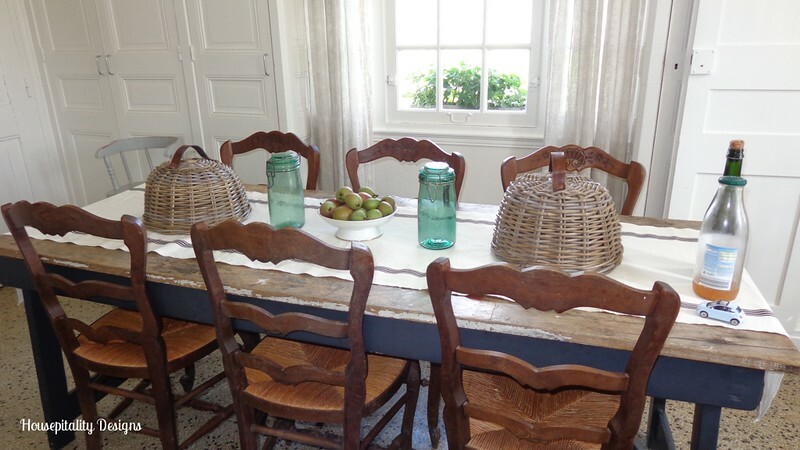 Look how wonderful the table looks with the fresh vegetables and bread…. 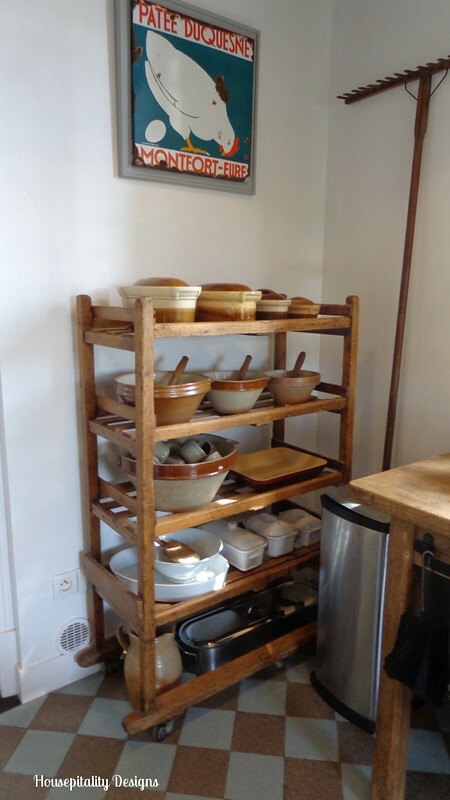 …..the bread was just picked up from the local bakery….Oh how I miss the bread in France!! A beautiful antique chandelier hangs above the table. Can you just imagine preparing your meal in front of this spectacular view? 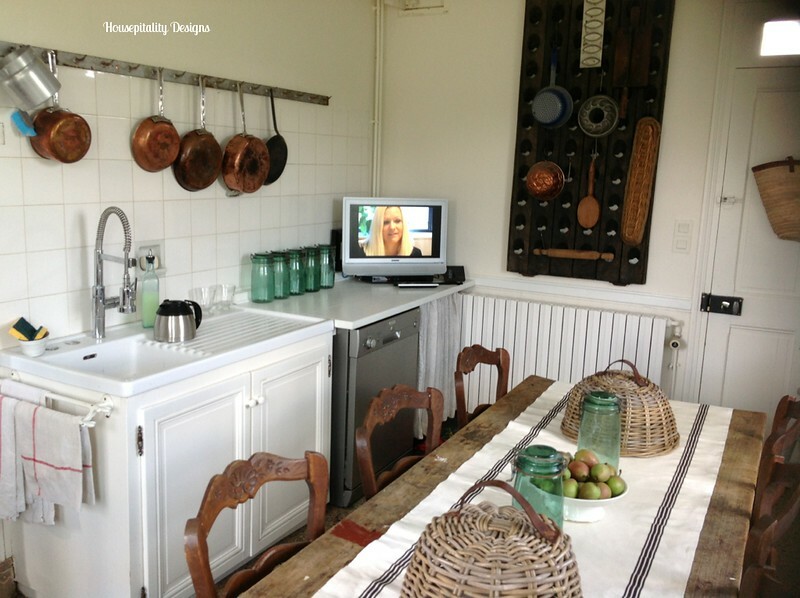 To the left of the farm table is an area where Cat stores and displays her beautiful kitchenware. I know your hearts are just skipping a beat!!! …..a show stopping cabinet atop a buffet and one of the corner cabinets that flank the door of the kitchen. 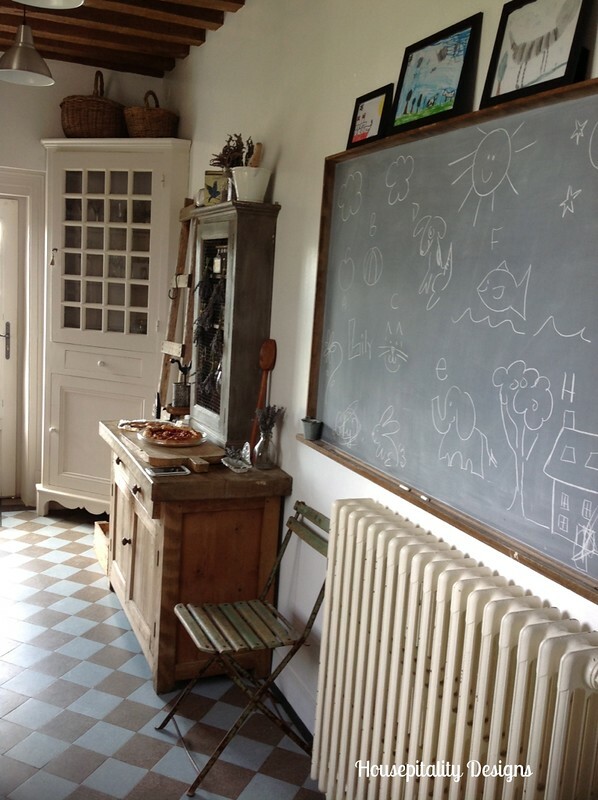 Also notice the great artwork done by her children on top the the chalkboard…so very cute!! On this buffet was our delectable tarts made by Cat…Apple/Cherry and Pear..they were incredible! Cat’s incredible French antiques are everywhere… she displays them all in the most beautiful ways. 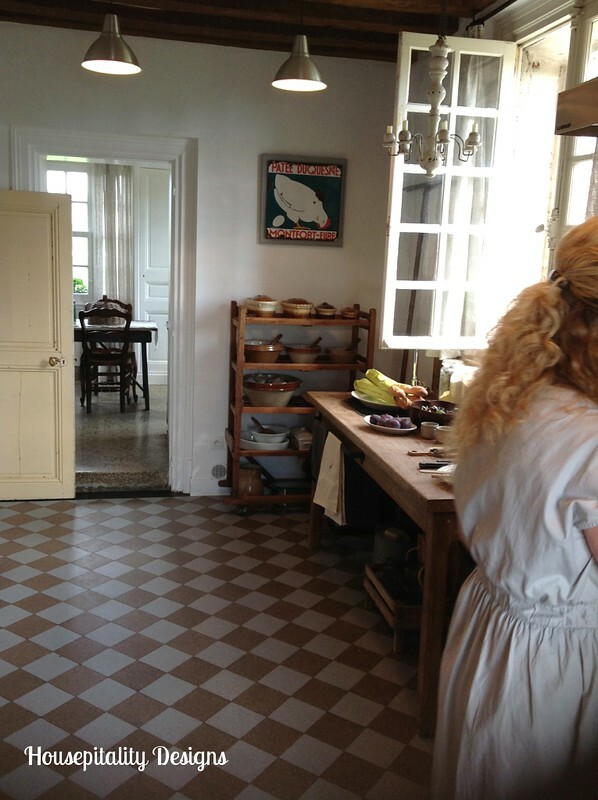 At the other end of the kitchen…you enter through a doorway into another part of the kitchen…. The refrigerator is at the other end of the room. ………..every day…as you can see the table is also used for rolling little cars! 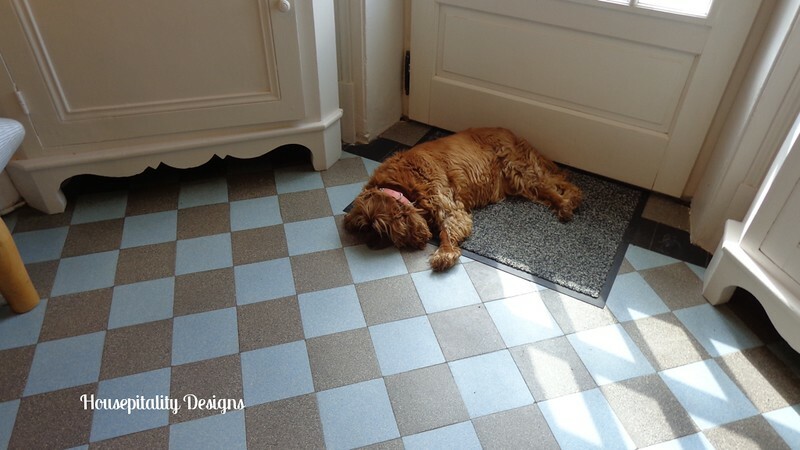 Now who would not want to lie on that gorgeous tile floor in the kitchen…guarding the door! It was a most memorable day at Rabbit Hill!!! Is your heart still skipping a beat???!!! And thanks to my friend Merry for the photos of 1, 8, 11, 13 and 15..
We all were constantly snapping away taking photos of this magnificent home! Hi Shirley, I love that all of you are sharing different pictures of Cat’s home. The kitchen is wonderful, I love the chairs around her table. The dog by the door is so cute. I also really like the warmth in this room, you can tell they really live in this room and that chandelier is pretty to. What a lovely day you had there the sky was so blue that day. Shirley, your photos are lovely! Cat’s kitchen is fabulous! 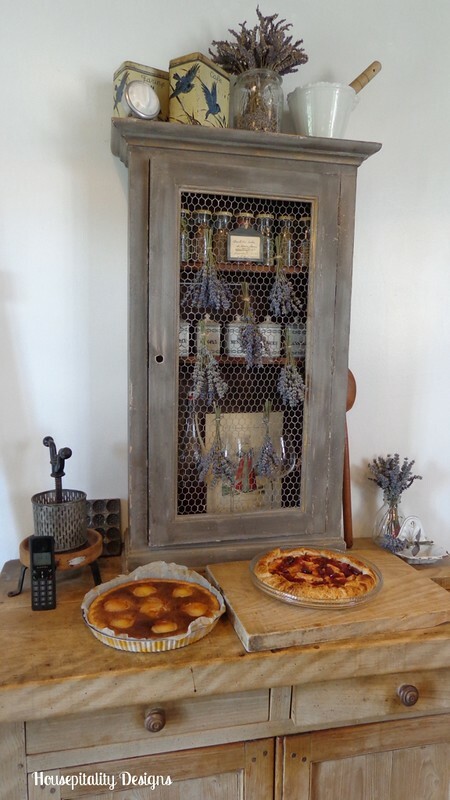 The chalkboard, willow cloches, the lavender and copper cookware are stunning! What a wonderful experience!It’s making me want to go next year! Thanks for sharing pieces of your amazing trip with us! Ohhhhhh Shirley what a beautiful kitchen. This is so gorgeous. I have gone back over each picture a few times. Love them all. 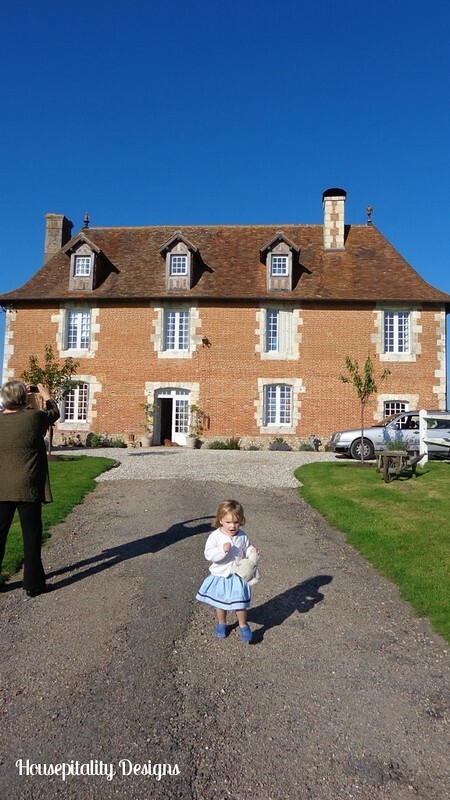 Cat has a beautiful French home and you girls must have just loved being able to stay with her. Thanks for sharing this beautiful trip with us. I was so excited to see the new post this morning. I want to see more!!!! what a wonderful kitchen! love those chairs around that amazing table! 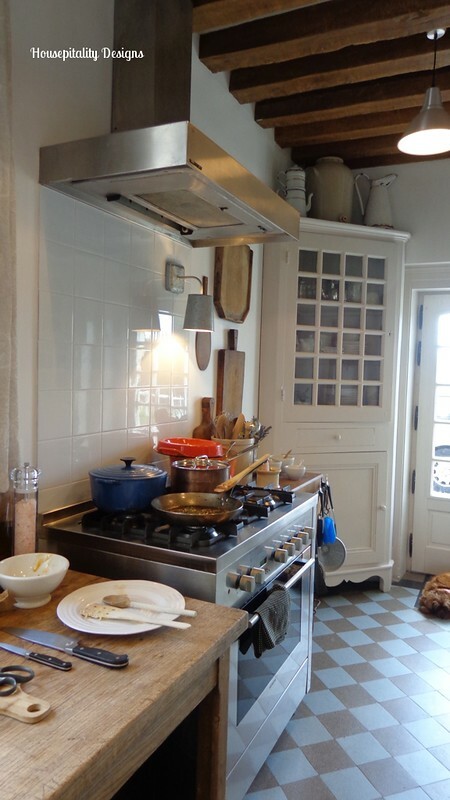 My heart skipped several beats…..what an amazing kitchen!!!!! Everything is sooooooo beautiful….LOVE! I have to go back and look at the pictures again…..
Beautiful pictures Shirley. 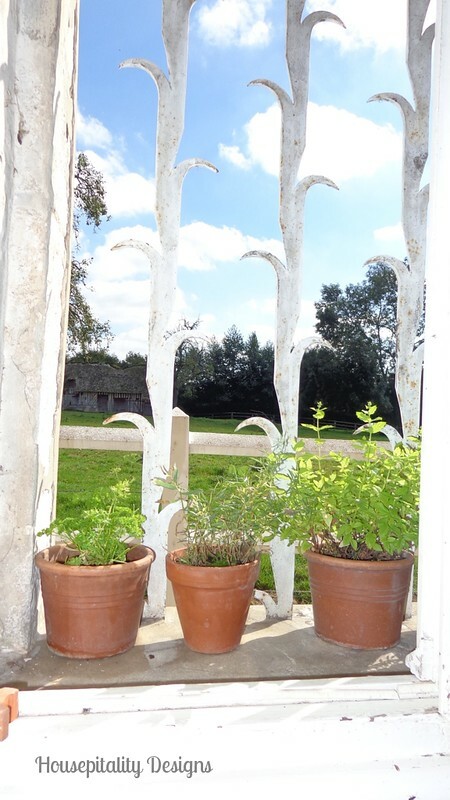 I’ve pinned to my French Country Style board on Pinterest. Sigh . 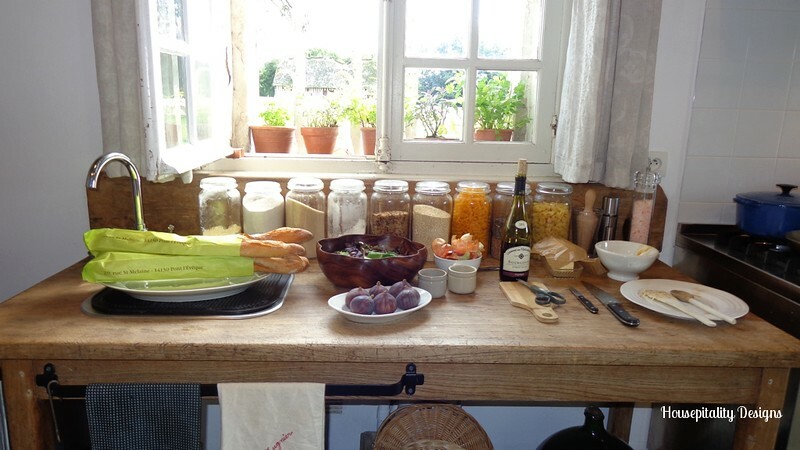 . . how wonderful it must be to look out onto the French countryside while preparing meals. So glad you had fun on your trip and I look forward to more photos! Absolutely wonderful! Love seeing pictures of the real thing. I often wonder if our interpretation of french country is anything like the real thing. Seems like we aren’t too far off. What a wonderful experience Shirley! Thank you for bringing us along with y’all! I am enjoying seeing everybody’s posts about your trip. Oh my, Shirley! What a wonderful home! I just love that kitchen!! I don’t normally Pin pictures, but I did here! Your host looks like a lovely person. I haven’t been doing much blogging lately, but it sounds like you had a wonderful time. So glad to hear you had a great trip!! Absolutely beautiful!! Such warmth and a sense of “home”. I can only imagine how delicious those tarts were. My heart didn’t just skip a beat – it stopped! Help I need CPR – it’s gorgeous! kirby carespodi’s recent post…Halloween Tablescape! I die, Shirley! One of the most beautiful kitchens I have ever seen. It’s so real…the thing that I love the most is how functional it is. I love how she has everything she needs close at hand! What a wonderfully authentic kitchen, Shirley. It’s beautiful. Thanks so much for these posts! 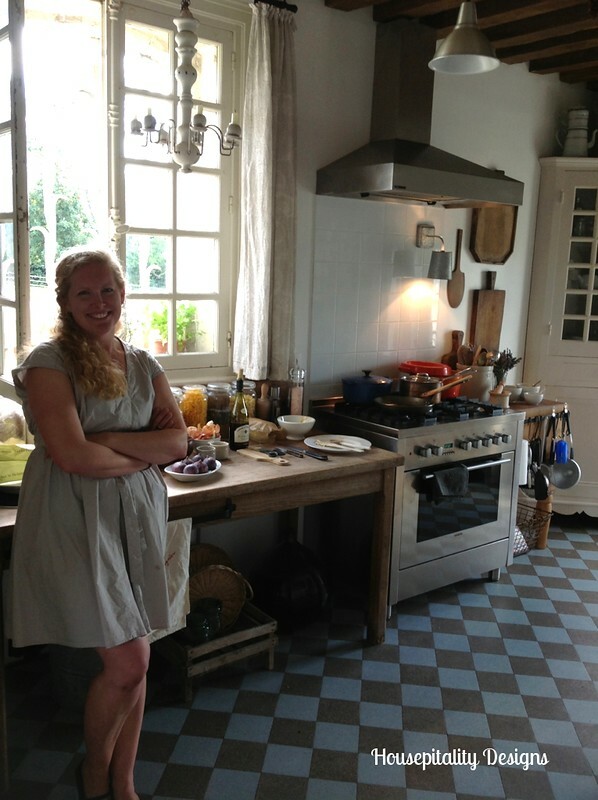 The kitchen reminds me very much of the one in the chateau where we wer for the French Foodie Adventure in the spring. I especially like the windows, the way they open to let in the fresh outside smells. Where was thee house? love, love, love that farmhouse, and it’s location. just gorgeous! Great pic of Cat and I did not want to leave her kitchen. 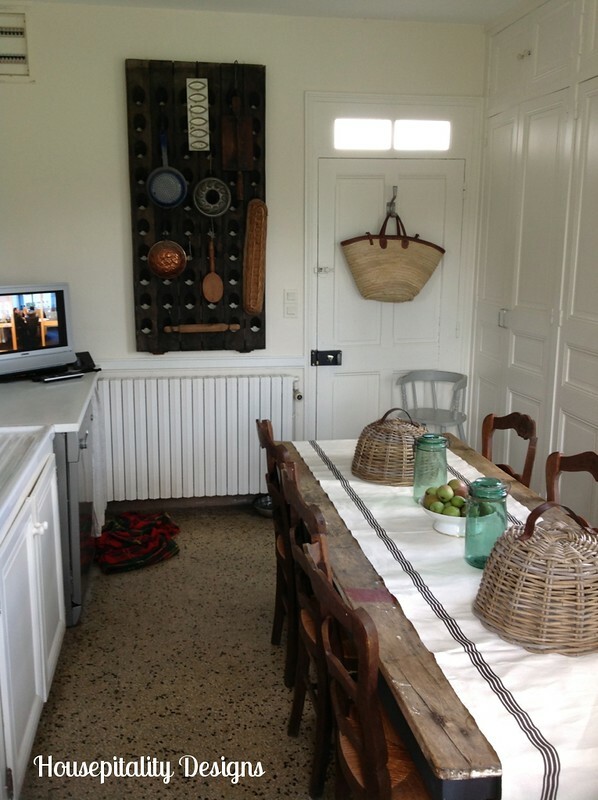 Shirley, What a lovely kitchen and I love the farmhouse tables. Wow, Shirley! What a stunning kitchen/dining area!! I love that huge chalkboard! Yup, heart is still skipping! This kitchen is so quaint and homey! Love the checkered floor and her amazing collections. Oh how cute is that little one in the last pic! Jann Olson’s recent post…Upstairs & Downstairs Halloween Mantles. . .
SWOON! A big, happy, Frenchy sigh from me Shirley! LOVE that kitchen! Just love the character and simplicity of it all! Thanks for sharing! What a gorgeous kitchen Shirley…love all her beautiful displays especially the one on her kitchen table! My heart is TOTALLY skipping a beat! Awesome post – I’m jealous! Thank you so much Shirley! Such a fun post and I love seeing the spaces with your perspective as much as we loved having you all in our home! I am loving this farmhouse! Absolutely charming! I’m off to take a look at part 1! Oh my gosh! My heart is not skipping, it’s RACING! That’s what I call a real kitchen! I absolutely love those 2 corner cabinets flanking the entry door. Someday I hope to experience a trip like this, but for now I’m enjoying how you’re bringing it to me through your posts! I’m loving seeing more of the details of Cat’s amazing home since she doesn’t show a whole lot of the inside of her home on her blog. Her antiques are to. die. for. Love the farm table in their everyday eating room. This kitchen is absolutely perfect, and I must say that I love everything about it. The windows are just beautiful. I especially love the floors. Oh, how lovely!! Blessings to you! Wow, Shirley, it’s absolutely charming!! 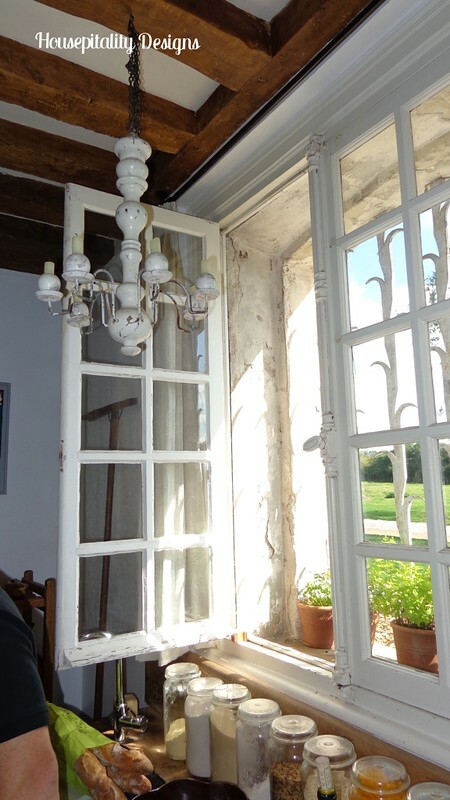 The quintessential French farmhouse! Lovely French kitchen. Her table is so pretty too! Makes me want to go back to France again, which is definitely on my list. Have a wonderful day!